The area surrounding Astoria, Oregon, near the mouth of the Columbia River, has a long and varied history. Lewis and Clark spent the winter of 1805-1806 at Fort Clatsop, which is south and west of today’s Astoria. In 1810, the Astor Company made Fort Astor the center of its fur business. From 1813 to 1818, the area was under British control. In 1818, it became joint British/U.S. territory and remained so until 1846, when it became a permanent part of the United States. The first post office west of the Rocky Mountains was founded in Astoria in 1847. It was not until 1876, that Astoria was incorporated as a city. Washington Irving published a romanticized novel of the fur traders entitled “Astoria” in 1836 with the encouragement of John Jacob Astor. Astor felt that the nation did not realize the importance of the fur traders and wanted them memorialized. “ Astoria” cemented the importance of the Western territories in the public psyche. 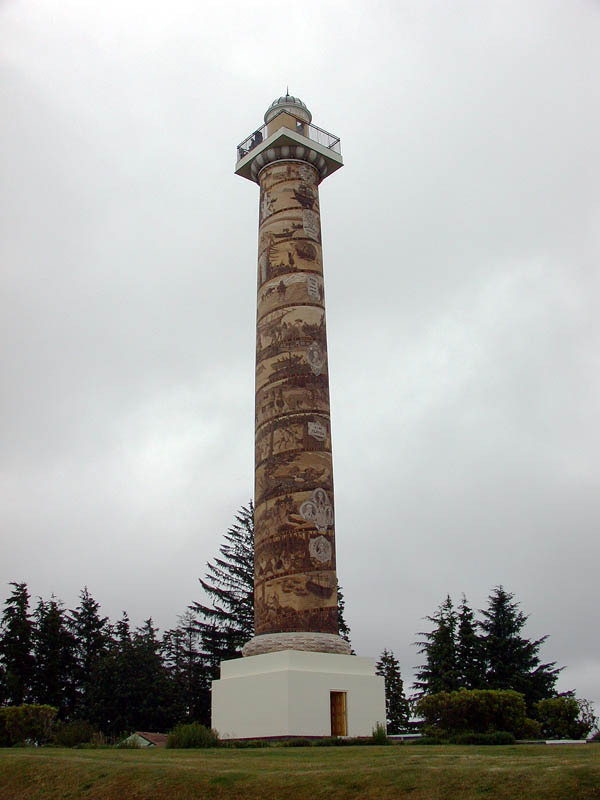 The Astoria Column was built by the Astor family in 1926, on the highest hill in Astoria to commemorate Astoria’s early history. The view of the surrounding area from the column is magnificent. You can climb the 164 steps of the column to the observation platform for and even more amazing view. Nearby Fort Stevens guarded the entrance to the Columbia River from the time of the Civil War through World War II. Fort Stevens is one of two places in Oregon that was bombed by the Japanese. On June 21, 1942 a Japanese submarine fired 17 shells in the direction of the fort. Luckily the bombs only did damage to a baseball field and some telephone cables. Astoria remained a major port on the west coast for well over a century. It was a thriving community until the mid-1970s when Bumble Bee Seafood closed its headquarters here. The lumber industry also began to fade and in 1989, the plywood mill that was the city’s largest employer shut down. A partial replica of Fort Astoria is located in downtown Astoria at the site where John Jacob Astor’s fur traders originally built their fort. A replica of Fort Clatsop invites you to step back into history, where National Park Rangers dressed in buckskin explain muzzle loading and shooting, hide tanning and candle making. Fort Stevens is now a State Park. When you visit Fort Stevens you can take a self-guided tour of the fort and explore the gun batteries and visit the Military Museum. Astoria today looks more towards tourists and artists than fishermen and lumberjacks. However, Astoria has not abandoned its marine past. Every February for the past 15 years, Astoria has hosted the Fisher Poets Gathering, an event that celebrates all things maritime in art, music, and literature. For more information about Astoria, Oregon check out the following resources.